Canadian scientists recently found the so-called “lost” Franklin expedition in the Arctic. Turns out, it was exactly where the Inuit have been saying it was, all along. Who would have thought? Who would have thought that, if we had only listened to these ingenious navigators and survivors, we could have saved ourselves a whole lot of foolishness? If you would like to know how our culture needs to find its way in the 21st century, I would suggest that you save yourself a lot of trouble, and listen to Tanya Tagaq’s album Animism. Animism is a masterpiece because it transcends opposites. Dizzyingly complex and sophisticated in structure, it also completely hits you in your guts, in your soul. It takes traditions that are tens of thousands of years old, and makes truly innovative music, music that could not have existed without Tagaq and her brilliant collaborators, violinist Jesse Zubot, drummer Jean Martin and DJ Michael Red. The innovation on Animism is an argument not for moving beyond, but for putting more emphasis on the value and necessity of the traditions. The rootedness is where the newness of the record comes from. That will not be a contradiction for you, if you listen properly. Animism seamlessly uses the technology of the digital recording studio to make an encyclopedic argument for the natural world. In fact, it will erase from your mind the notion of human artifice and nature as opposites. If you listen. If you listen, you will careen through a panorama of the contradictions of existence. You can hear the living land, and the land under assault. You can hear children being born and conceived. You can hear the torture of the innocent, and the glory of the tenacious, unstoppable force of life. If you listen you can actually hear the sound of a people defying genocide to rise, wounded but alive, strong, and ready to fight. 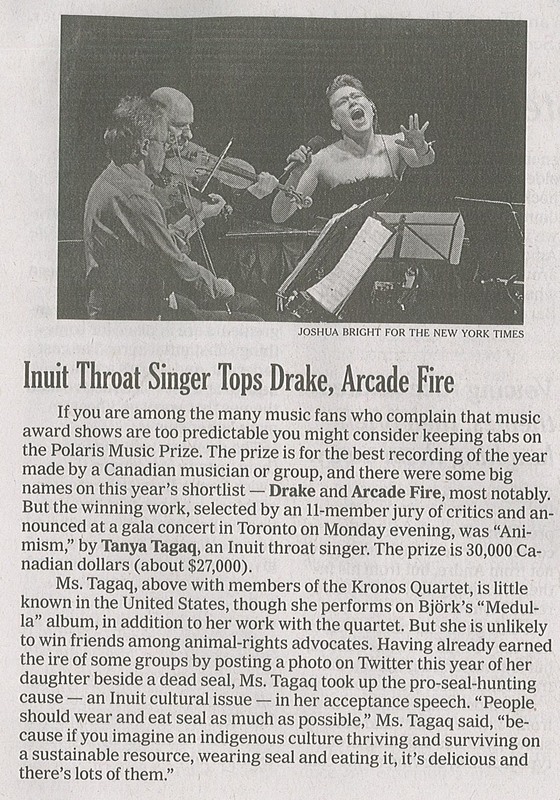 There is no artist working today more emphatically herself, more incomparable than Tagaq. There is no musician in this world more powerful. Animism is the album that finally translates her unique power to the recording studio. Can you hear it? If not, try listening some more. You’ll find it, eventually. I hope that in this instance, it takes people less than 170 years. Tanya Tagaq’s music isn’t like anything you’ve heard before. Unnerving and exquisite, Tagaq’s unique vocal expression may be rooted in Inuit throat singing but her music has as much to do with electronica, industrial and metal influences mas it does with traditional culture. Animism, the new album, was produced by west coast shape-shifter Jesse Zubot (Dan Mangan, Fond of Tigers). The record features Michael Red (Low Indigo), a live programmer whose wild northern field recordings often serve as Tagaq’s de facto backing band, percussionist Jean Martin and Belgian opera singer Anna Pardo Canedo.